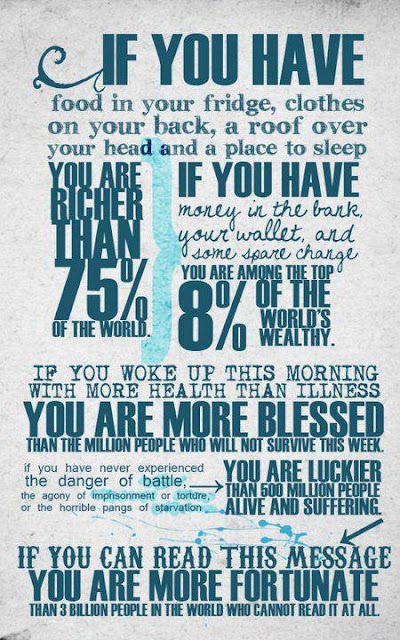 This is such a nice post and I always think the same; I always try to be grateful for just how lucky we are to have all the things we take mainly for granted! Its so strange you posted this, I found it on my facebook where I posted it a few years ago and was reading it out to my mum last night. I think it really hits a nerve and its a pretty powerful graphic. Great image, really hits home exactly what we have! Does take a little reminding every now and then with most of us! Great post, nothing better than staying positive! Just came across your blog and I love it!